Coming soon: The Transverter Module! An outstanding auto-tuning filter allows a high blocking dynamic >130dB for disturbers outside ±20kHz of the receiving frequency. The start of production is planned for end of 2017. A number of modules are already pre-ordered. Interested OM's are asked to send a non-binding reservation via the ADAT contact form. This will accelerate the delivery. The ADT-200A with new Functions! 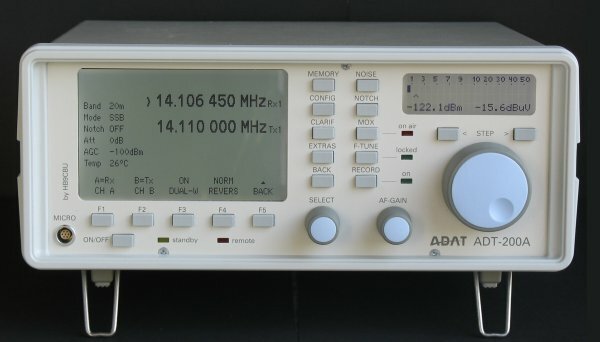 The ADT-200A is world's first amateur radio transceiver with completely digital signal processing. The device is equipped with the latest DSP technology, moreover it is produced professionally with state-of-the-art technology. The software algorithms for the signal processing have been carefully developed and have been optimized several times. Tests show that the ADT-200A can keep up with even the best commercial receivers regarding selectivity, sensitivity and intelligibility. As a novelty, the transmit signal is processed by adaptive predistortion, a technique that is used for the first time in amateur radio. This technology stands out due to high efficiency and a remarkably clean transmit spectrum, combined with an exceptionnally clear modulation.